People ask what the difference is between Fair Trade and non-Fair Trade quinoa and the answer is 23 cents and a life. This is the new dividing line between being a subsistence farmer barely covering costs and one making a living wage, earning on the average a little more than a hundred dollars a month. Last year, all quinoa was $.92 a pound earning Bolivia’s once impoverished quinoa farmers a dignified wage and enabling their children to complete school ant attend college (quinoa prices had been growing steadily since 2007, so the improvements in farmer livelihoods was over time). This year (2015), Peru flooded the world market with cheap agro-chemical, conventional quinoa, for the first time out-producing Bolivia and causing market prices to plummet. 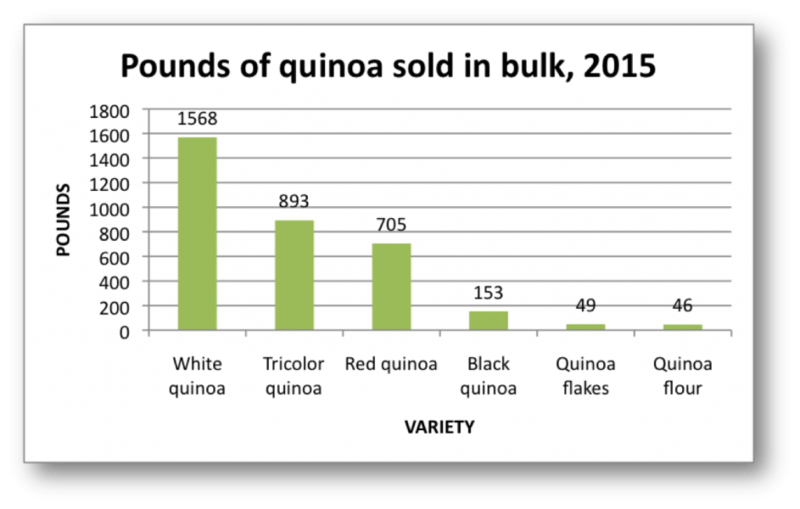 Conventional farmers in Bolivia currently earn $.19 a pound for their quinoa which does not even cover the costs to produce it. Certified organic farmers are earning $.36 a pound and the Fair Trade price now stands at $.59. That 23 cents is significant and represents the difference of a child going to to college, a sick family member visiting the doctor, good quality food to be purchased, or not. 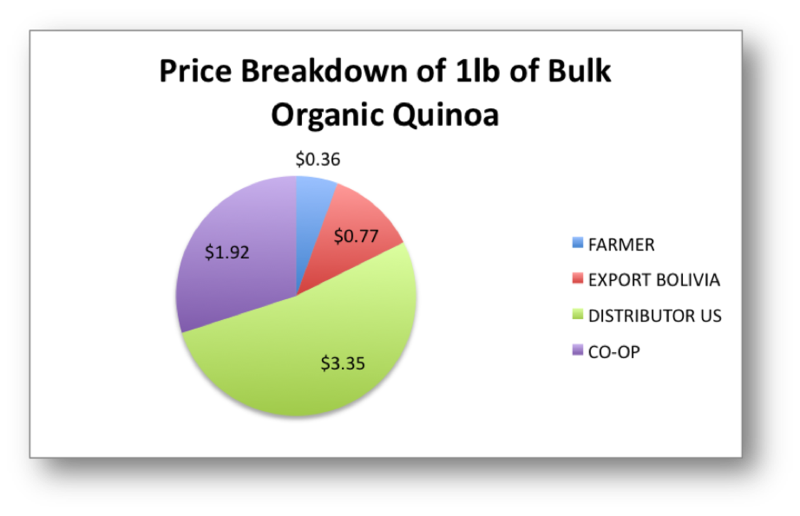 The cost breakdown of bulk, organic, Bolivian quinoa, distributed by UNFI and sold at the Brattleboro Food Co-op for $6.40. I have been continuing the study of quinoa here in the US: working students at Mount Holyoke College to explore the consumer market for chips and students at UMass to author a white paper on how education reform and participatory democracy in Bolivia empowered producers to manage and control world quinoa markets. I also have been sharing quinoa data with the general public. One presentation was made this week at the Brattleboro Food Co-op, the place where this quinoa study began. Our town of 15,000 consumed several thousands of pounds of Bolivian organic quinoa since January. None of it Fair Trade. When I asked the UNFI distributor who supplies the co-op’s organic bulk quinoa, why they did not carry Fair Trade quinoa, he replied that there was no demand for it and was not sure if there was a difference. In May 2015 when I spoke to the distributor there was no real price difference, though now with the quinoa market crash, there is. Please remember the difference 23 cents makes, and ask for Fair Trade quinoa.